For 12pt and 14pt. Gloss Coated Cover, UV Coating will be applied to the color sides, unless No UV Coating on Back is selected. If you select Color Front/No Back or Color Front/B&W Back, only the color side (front) will be coated. For rack cards, please build your print-ready digital files by adding 0.1" bleed to each dimension (or 0.05" bleed on all four sides). 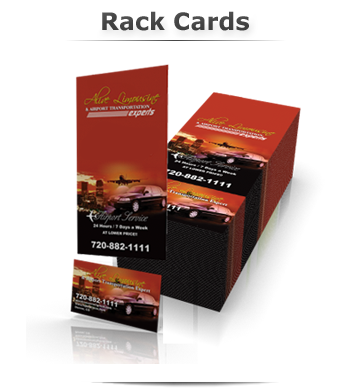 For example, a 4" x 9" rack card with the full bleed should be 4.1" x 9.1". Please design your files on our templates to ensure proper bleed.